Planet Plumbing formerly used MYOB and spreadsheets to manage projects, accounts and project estimating. However we began noticing the negative impact and risks of using an unintegrated and elementary system for project management and financial management of the business. Rapid business growth gave rise to greater responsibility to better manage projects across multiple sites, as well as specific client requirements and staffing. The necessity to estimate, manage, report on and forecast jobs more accurately to minimise financial risk were the key drivers in replacing MYOB and spreadsheets with Jobpac. Jobpac is an integrated accounting, project management, human resource and payroll software solution for the Australian construction and engineering sector. It gives us fully integrated job costing to the financials, a full contract valuation model and consolidation of multiple business units with excellent project and financial reporting. Our business was keenly aware of the need for accurate business forecasting, cash flow and financial planning. With the Jobpac solution fully deployed in Planet Plumbing, we are able to view, assess and value projects across the group in a timely manner. Jobpac has significantly lifted the bar on our project reporting capabilities as it allocates budgets on all jobs at a detailed level. It also gives us proper administration of variations from a single, integrated platform which provides us with better control of claims and debtors as well as month-end forecasting. As part of the implementation of Jobpac, we chose to implement Jobpac Business Forecasting. This gives us the information to assess and value projects controlled by various project managers across the country. It ensures we are disciplined and consistent in the way we process valuations and conduct forecasting and an added benefit is that we can now extend the monthly valuation process to other elements such as work in hand and cash flow forecasting, effectively raising the bar in terms of month-end processes. Jobpac supports the business processes of both commercial and civil construction including subcontractor organisations like ours. Our projects tend to be lump sum and cost plus, but Jobpac also has strong support for rates based and civil works. In many ways Jobpac has far exceed our expectations. With Jobpac reporting we now have much more visibility across the business than I could have imagined. If you are not using an application like Jobpac once your business revenue exceed $20 million per annum then you face commercial suicide. Our return on investment is demonstrated by a much deeper understanding of our financial position. For more information on Jobpac, see www.jobpac.com.au. What kind of project manager is Jobpac for? Jobpac is suited to project managers running commercial or civil engineering construction (C&E) jobs that can be either lump sum, cost plus, rates-based or construction management contracts. Who is the ideal user who will get the most from the software? A construction and engineering company with +2 users up to +1,000 users including project managers, contract administrators, estimators, executive, finance and administration users and payroll/human resource users will get the most from Jobpac. What does Jobpac have that no other software has? 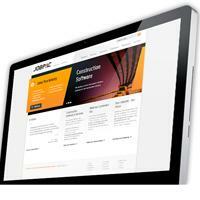 Jobpac is a fully integrated, real time, modern business system for the construction and engineering industry. It can be deployed as an enterprise system managing financials, procurement, subcontracts, variations, claims, invoicing, retention management, BAS, labour costing, document control, forecasting and plant and stores inventory management is all included. Or it can be deployed on a cloud-subscription project by project basis integrating to a company’s backend corporate system to manage a project. Jobpac offers comprehensive business forecasting, risk and opportunity management and contract valuation management and reporting that is not matched by any other software solution. Anthony Alafaci is the CEO of Planet Plumbing Pty Ltd an Australian-owned private company providing quality plumbing services to a range of clients. The company is currently involved in the hydraulic design, development and construction of some of Australia’s most prestigious projects. Anthony Alafaci has written 1 articles for us.